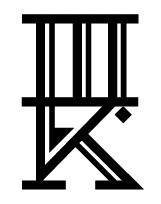 This cool tattoo of Siamese Twins has tattoos of its own, including the "10/30" visible on the chest. Lori explained that this refers to today, October 30, which she referred to as the "happiest and saddest day," noting that it was the day she married her husband, but it was also the day he died, one year later, on their first anniversary. She credited the work to Mike at Read Street Tattoo Parlour in Baltimore. Thanks to Lori for sharing this lovely, yet haunting, tattoo with us here on Tattoosday! This is Angie (@angelina_monalisa) who had these chakra tattoos inked by Matt Huff (@matthufftattoo) at Brooklyn Ink (@originalbrooklynink). Angie explained the chakras to me, telling me that "they are basically the different portals of energy that connect the body to the physical and spiritual world, as well as the top chakra, which is your connection to all of the energy and knowledge of the universe (essentially, the Third Eye)." From top to bottom, the chakras are crown, third eye, throat, heart, solar plexus, sacral and root. She noted that "the root is technically located at the foot but, ya know, artist liberties." Read more about chakras here. 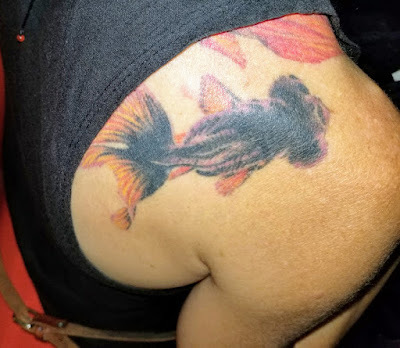 Thanks to Angie for sharing her tattoos with us here on Tattoosday! 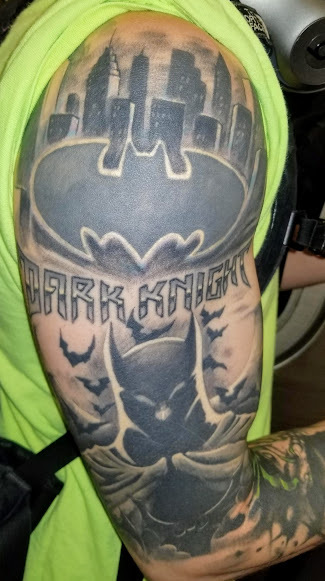 Sometimes tattoo posts don't always work out the way I'd like them to. Case in point, back in May I was in Virginia for some training and a couple of colleagues and I went out to the Crafthouse, in Reston. One of the servers, Kayla, had some great work. She let me take some photos and I handed her my card. However, she never followed up with me, so I can't provide much in terms of details. I wish I could credit her artist(s), but I never got that information. 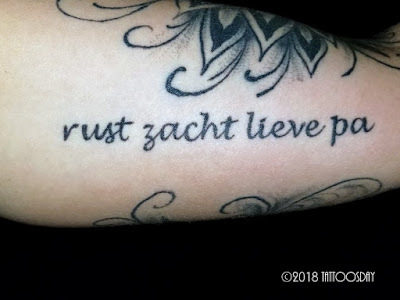 This is Dutch, and means "Rest softly, dear father." As best as I can recall, her work was, in part, dedicated to the memory of her father. Maybe one day, Kayla will find my card in an old pocket, and think to email me back so I can update this post. Nevertheless, thanks to Kayla for sharing this with us here on Tattoosday! 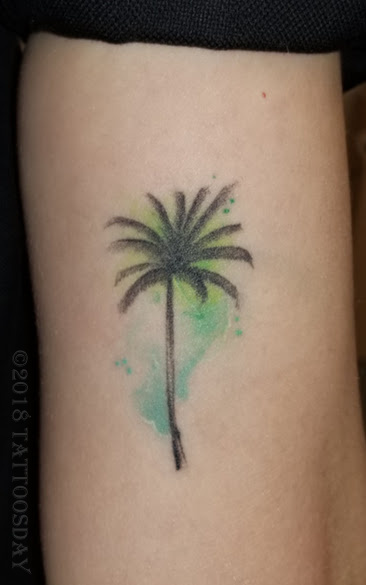 She got this because she loves "the resilience of palm trees," alluding, in part, to how they are able to withstand the worst storms when other trees splinter and blow away. She credited the work to Baris Yesilbas (@barisyesilbas), who works out of Gristle Tattoo (@gristletattoo) in Williamsburg, Brooklyn. Thanks to Liz for sharing her tattoos with us here on Tattoosday! This is the final post of The 2018 Alphabet Game. Last year, I only made it through the R, but this year, if you've been following along (the full recap post is here), you will know I took a detour after the W train and knocked out the 1, 2 and 3, because I was so efficient, and had to wait for the rush-hour Z train to start running. Already done above and beyond what I had hoped, except for the mighty Z train, Debating whether to go back for the 4/5/6/7. I'm beat. FitBit says 12,787 steps. There's little chance I can get those four done and the Z, when the Z runs only for an hour. Most amazing is that I approached 20 people and only 1 declined. I just stayed on the 3 and passed Fulton, so I will just take a break and chill at Broad, grab the first Z and hope and pray. 4:32 Back at Broad. Such a different approach from last year. The Z is now the prize and I have a small window to snag t. I have to get the first one and hope I get something right quick, or I will be plying for a miracle. The countdown clock now says 20 minutes for a Z. My worry is that it will be all business-folks, but I am going to try and get it before we leave Manhattan so I can make it back at a reasonable time. Josh got this work done in three sessions from Dustin Horan (@dustinhoran) at The Dead President's Lounge (@thedeadpresidentslounge)in Albany, New York. Thanks to Josh for sharing his cool tattoo with us here on Tattoosday! And this concludes the 2018 Alphabet Game. This was my route over 9 hours: j-A-A-A-B-C-C-D-E-F-G-G-f-J-4-L-M-d-N-Q-Q-R-R-w-S-W-j-1-2-3-3-3-Z. My best estimate places the journey at 33 separate trains, including the 16 lettered trains and 3 of the numbered trains. 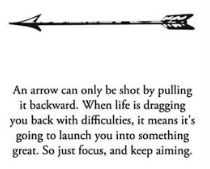 Looking forward to upping the challenge again in 2019! 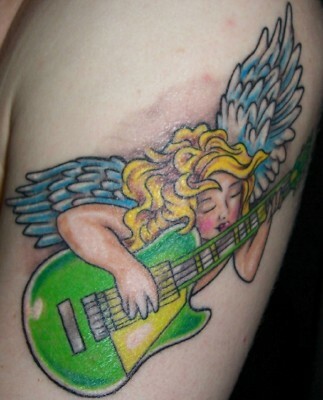 Thanks to everyone who participated and shared their tattoos with us here on Tattoosday! The Alphabet Game took a twist when I had to postpone my trip on a Z train until it started up during rush hour. So, for fun, I started going through the numbers, at least until I could make it to a Z. If you don't know what I'm talking about, start with this post here. I hopped off the 2 train at 34th Street/Penn Station and boarded a downtown 3 train. I stayed on the 3 until I got to Fulton Street, and then ran, at 3:30 PM across that platform to get an uptown 3 train, rather than heading further downtown. Wendy credited this to Diego Mannino (@diegovmannino) over at Daredevil Tattoo (@daredeviltattoo) in Manhattan. Thanks to Wendy for sharing her cool tattoo with us here on Tattoosday! So the last post found us in a plot twist. The Z train was running only during rush hour and I had time to kill. So I took a little numerical detour. If you're wondering what I'm talking about, best check out our master post here for the details. Rob credited the work to an artist named Toxyc (@toxycxlr), out of Autopsy Tattoo Studio (@autopsy.tattoo.studio) in Austin, Texas. 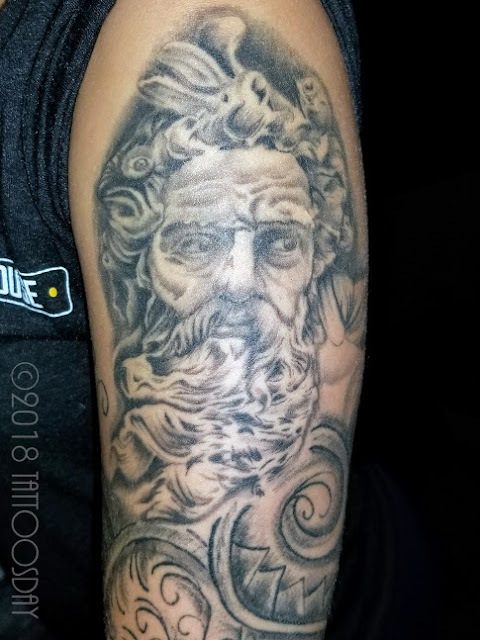 Thanks to Rob for sharing this cool tattoo with us on Tattoosday! On a hot day in August, I spent the day on the subway, trying to go through the MTA system in alphabet. Our progress so far is recounted here. Remember, last year when I tried this, I wrapped up on the R train after 5:00 PM. This year, I was determined to be more efficient. So, when I finished on the W train, I set my sight on the last letter in the alphabet. The elusive Z train. I remained on the W and switched at Canal Street - it wasn't even 3:00 PM! "1 train uptown leaving Rector." The Z only runs from 4:45 to 5:45. It's not even 3:00 PM. So, rather than sit around for nearly two hours, I decide to do so bonus inkspotting, and I headed to the 1 station at Rector Street. Headed uptown. Better than sitting around and waiting for a Z! I don't see going through all the numbers (1, 2, 3, 4, 5, 6, 7), but I'm in bonus territory here. 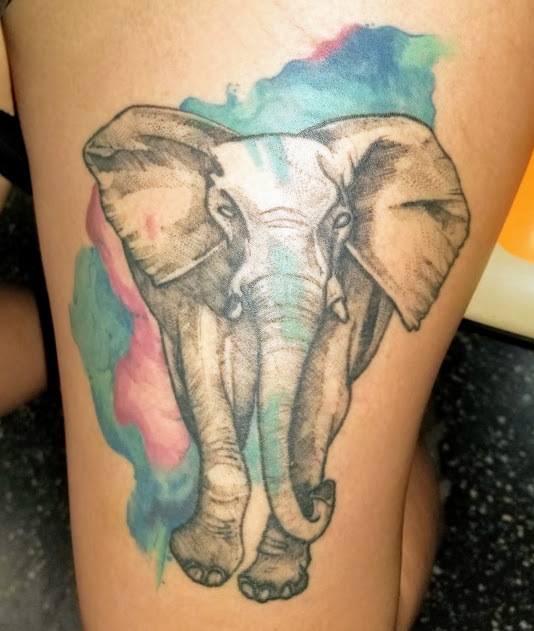 Fernanda credited this cool elephant tattoo to Lupe Trujillo, from Capitán Tatuajes in Puebla City, Mexico. Thanks to Fernanda for sharing her cool tattoo with us here on Tattoosday! 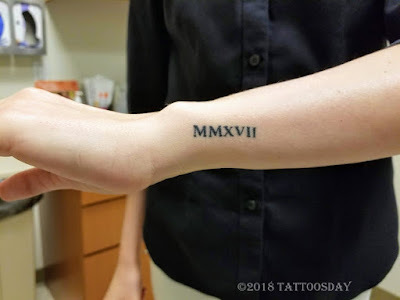 In case you're just joining in, I have been recounting a day in August when I played the Alphabet Game, spending the day attempting to go through the NYC subway system, in alphabetical order, finding a tattoo on every train line. You can catch up on the progress (or see the whole adventure) here. I had surpassed last year's attempt by successfully finding a tattoo on the S train and set my sights on the W. In case you were wondering, there's no U train, the T train was discontinued in the 1960s and the V train only ran from 2001-2010. 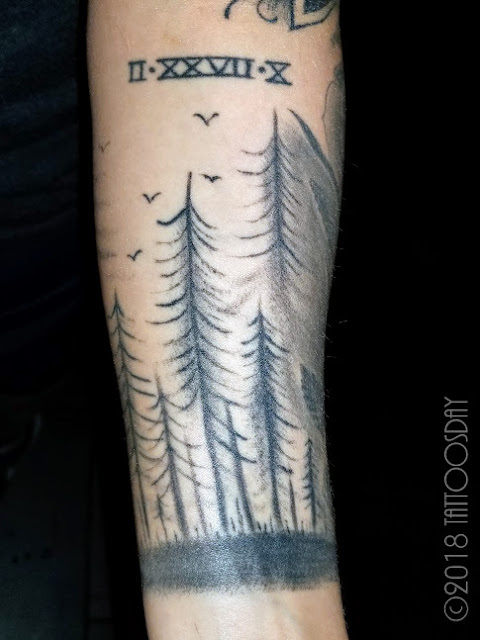 Mark had to hop off at 14th Street, so we had a very brief conversation, but he did manage to tell me the arrows represented strength, and he credited Daniel Delgado (@danieltattoos) with the work. Daniel currently works out of Brooklyn's Hand of Glory Tattoo (@handofglorytattoo). 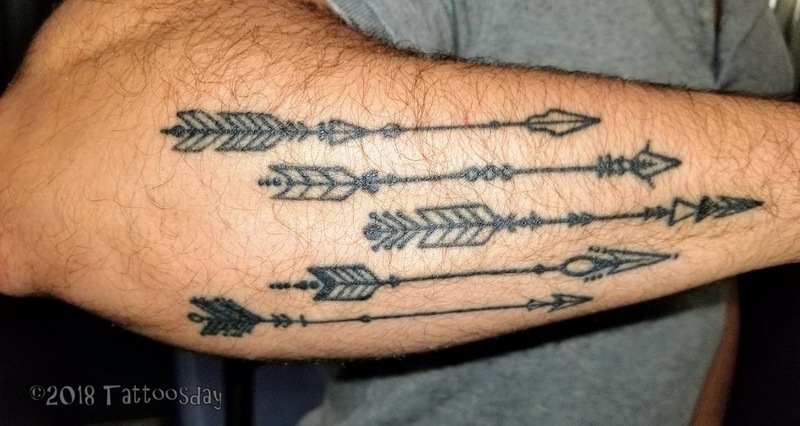 Shortly after meeting him, he sent me an instagram message saying "here's the true meaning behind my arrows:"
Thanks to Mark for sharing his arrows with us here on Tattoosday!